Growing up in a section of New York City known as 'Little Italy' in the 1940's and 1950's, a young Martin Scorsese found a deep connection inside the movie houses of the time--not just to the experience of viewing motion pictures, but also a closeness to his father, who sat with him in the darkened auditorium, fostering the future filmmaker's nascent love of the art form. So when Brian Selznick's award-winning novel The Invention of Hugo Cabret landed on his (Scorsese) desk via prolific producer Graham King, ...the OscarR-winning filmmaker found the tale profoundly resonant. Scorsese remembers, "I was given the book about four years ago, and it was one of those experiences...I sat down and read it completely, straight through. There was an immediate connection to the story of the boy, his loneliness, his association with the cinema, with the machinery of creativity. 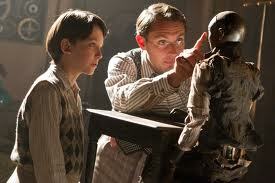 The mechanical objects in the film, including cameras, projectors, and automatons, make it possible for Hugo to reconnect with his father. And mechanical objects make it possible for the filmmaker Georges Melies to reconnect with his past, and with himself." For Scorsese, "It was particularly the vulnerability of a child alone that was striking. Hugo's living in the walls of this giant engine of a sort--the train station--on his own, and he's trying to make that connection with his father, whom he has lost." Throughout his extraordinary career, Academy Award-winning director, Martin Scorsese has brought his unique vision and dazzling gifts to life in a series of unforgettable films. Today, the legendary storyteller invites you to join him on a thrilling journey to a magical world with his first-ever 3D film Hugo. For this, Scorsese has assembled an impressive acting ensemble comprised of rising new talent working alongside venerated stars of the stage and motion pictures, including Ben Kingsley as Georges Melies, Sacha Baron Cohen as Station Inspector, Asa Butterfield as Hugo Cabret, Chloe Grace Moretz as Isabelle, Ray Winstone as Uncle Claude, Emily Mortimer as Lisette, Christopher Lee as Monsieur Labisse, Helen McCrory, Michael Stuhlbarg, Frances de la Tour, Richard Griffiths, Jude Law, Kevin Eldon, Gulliver McGrath, and Shaun Aylward. The movie Hugo is a Paramount Pictures presentation and isdistributed locally by United International Pictures thru Solar Entertainment Corporation. This Post-Valentine treat will open in cinemas starting February 15, 2012.